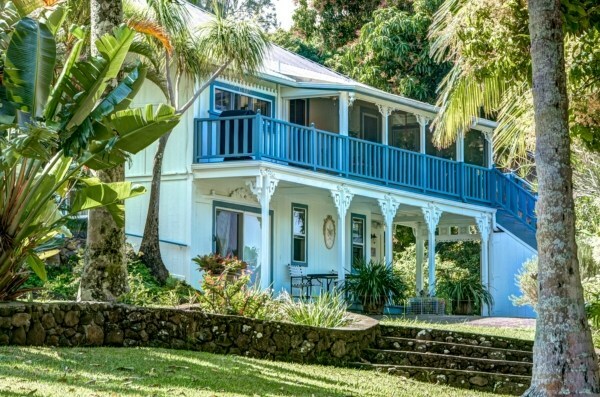 Historic homes in Hawaii are a rare breed. Historic homes that have been renovated with updated roofing, plumbing, and electric, plus modern finishes like stainless steel appliances, are even harder to find. Add expansive lawns, stunning ocean views, a palm tree lined driveway, koi pond, hot tub, and a gazebo, and you’ve got an incredible Big Island historic home for sale. Built in 1939 (20 years before Hawaii became a state! ), this 3 bedroom, 3 bathroom Honokaa home is simply amazing. The paved driveway lined with tall royal palm trees and the expansive front lawn lends a regal feel to the property. As you approach the spacious 1,542-square-foot home, you can’t help but admire the incredible Pacific Ocean views. There’s plenty of room to relax and enjoy the view both on the downstairs lanai and the wrap-around second floor balcony, which is perfect for watching the sunrise or enjoying your morning coffee. It’s truly gorgeous! 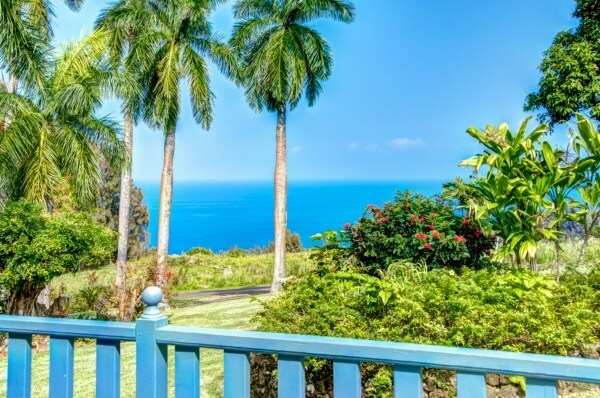 The ocean views from this historic Honokaa home are simply breathtaking. This lovely Hamakua Coast property sits on a little more than an acre of land on a private road with only four other homes. The backyard is a secluded park-like oasis that’s a wonderful and peaceful retreat. 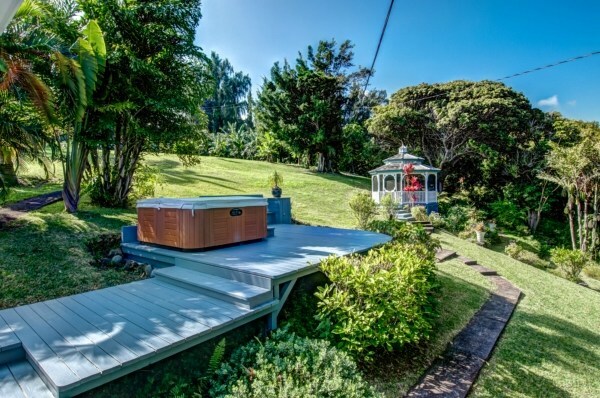 A koi pond, herb garden, raised flower beds, and a sitting area near the seasonal stream that borders the north boundary of the property give this Honokaa home a sense of relaxed serenity. The large backyard features a screened-in gazebo and a six-person hot tub. Delightfully fragrant flower trees like puakenikeni dot the landscape, as do numerous tropical fruit trees including avocado, coconut, macadamia nut, banana, mango, black cherry, citrus, lychee, and more. The backyard also incudes a six-person hot tub and a large screened-in gazebo – perfect for entertaining and relaxing. The inside of this lovely home is as wonderful as the outside. Refinished solid wood floors add to the charm of this home. The open dining and living room feature nine-foot ceilings and a wood-burning cast iron stove. Just off the great room is a country kitchen that’s been updated with stainless steel appliances and a gas stove. And just off the kitchen is a screened-in second lanai with a barbeque area. 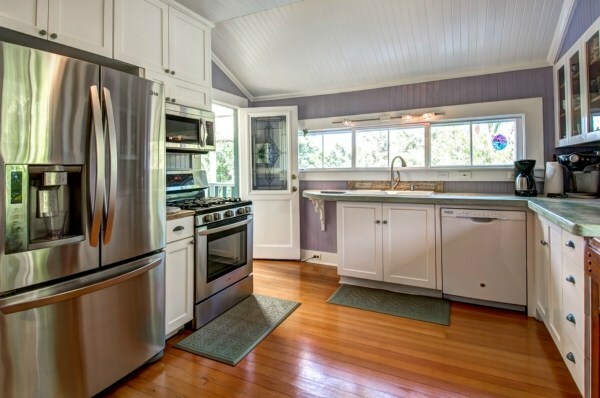 The country kitchen has been updated with stainless steel appliances and a gas stove, as well as cement counters. 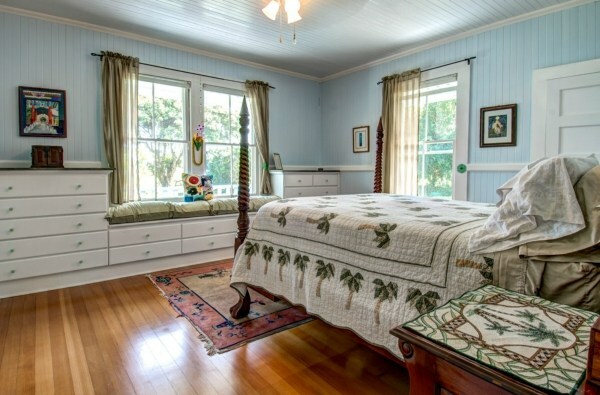 The bedrooms, which feature original built-ins, are light and airy. And the master bathroom has been updated with double sinks, a claw-foot cast iron tub, and a separate shower. It, like the other bathrooms, features ceramic tile floors. The master suit features refinished solid wood floors and original built-ins. Two additional bonus rooms downstairs provide plenty of options and can be used as either a recreational rooms, extra office space, or more. The downstairs bonus rooms also have a separate entrance and are well suited for houseguests. The dining room and living room feature 9-foot ceilings and a wood-burning stove. 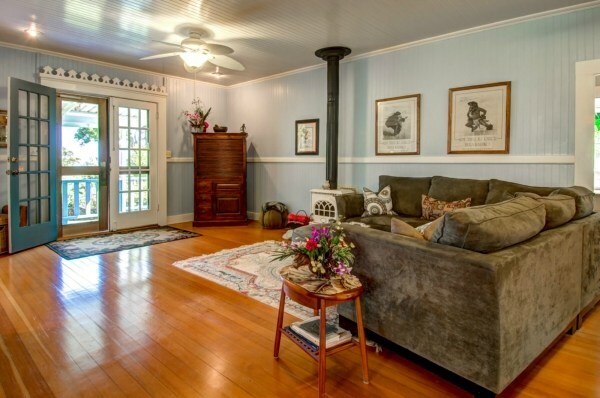 Available for $799,000, this lovely home is full of character and charm inside and out. It’s simply lovely. If you’d like more information on this and other Big Island properties for sale, give me a call today at (808) 937-7246 or email me.